Zaru soba is boiled and chilled buckwheat noodles (soba) served on a bamboo basket (zaru). The name of this dish was derived from the way the noodles were served over a bamboo strainer during the Edo Period. Usually, the noodles are served with a refreshing dipping sauce (mentsuyu or tsuyu) and some toppings. 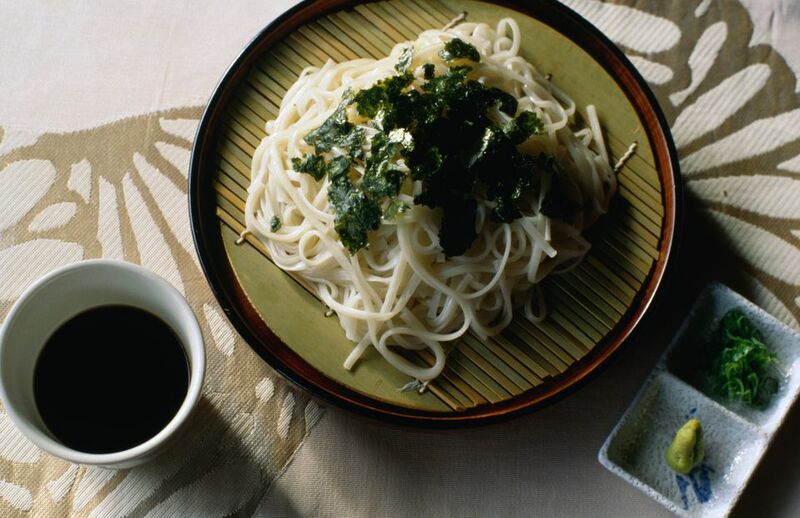 Light and refreshing, this Zaru Soba will be your go-to staple on hot summer evenings. You will find 2 kinds of soba noodles in the Asian grocery store, the primary differences between the varieties are texture and flavors. Ju-wari Soba is made entirely from buckwheat flour, giving it a dry and rough texture, but strong nutty aroma. Hachi-wari Soba is a combination of 80 percent buckwheat flour and 20 percent wheat flour, so it's much smoother and has an al dente texture when cooked. It's easier to prepare and enjoy, but has less buckwheat flavor. It’s hard to say which soba is tastier and more delicious; it really depends on personal preference. You might also see packages of green (matcha) or pink (ume plum) soba noodles in Japanese grocery stores. The loveliest and the most authentic way to present soba is on a zaru, which means “a strainer” in Japanese. Place the scallions and wasabi in the center of the table with the noodles. Each diner then mixes a dab of the wasabi and 1 tablespoon of the scallions in a portion of dipping sauce and, using chopsticks, dips noodles into the sauce. If you like, add flavors like grated ginger or orange zest into the sauce for extra flavor. Put the mirin in a sauce pan and heat. Add soy sauce and dashi soup stock in the pan and bring to a boil. Stop the heat and allow the sauce to cool. Put the noodles in a colander and rinse under cold running water to remove the starch. If it's necessary, add a little bit of cold water in the pot to prevent overflowing. Divide soba among four serving plates or zaru. Divide dipping sauce among four small cups. Put toppings on small plates and serve them on the side of soba.